Blanc is one of Denver's newest and hottest weddings venues. Located in RiNo, Blanc has an urban industrial feel with exposed brick, a gallery, and a rustic barn, and there are plenty of options for different photography looks both outside and indoors, along with beautiful natural light. It is a versatile and eclectic space with many possibilities for your wedding set-up. 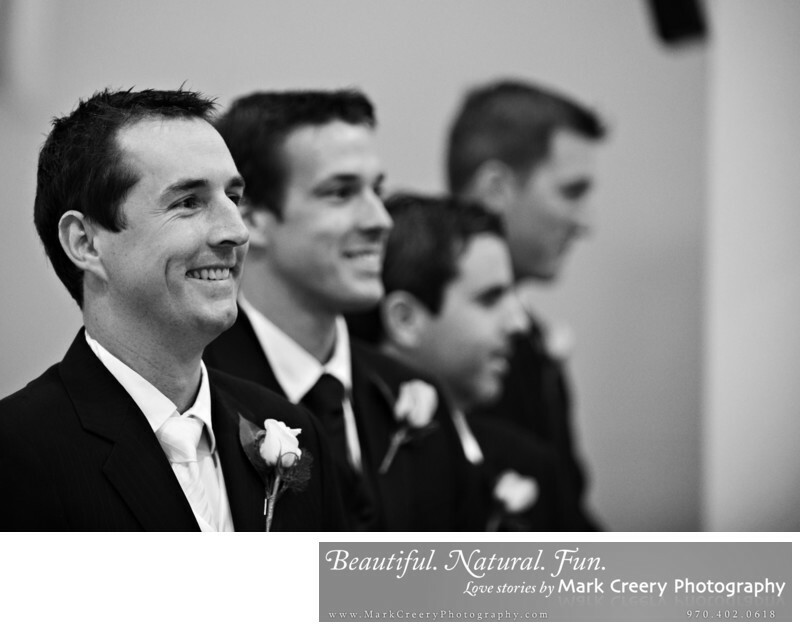 In this wedding photo the groom is smiling as he sees his bride walking down the aisle for the first time. There is just pure happiness in his expression. I shot the photo from this angle so that I could have the groomsmen's heads in a line with the groom to show their expressions as well. This gives more depth and interest to the image. Mark Creery Photography excels at capturing funky, urban-chic venues, having photographed several years in the capital city of Australia. If you're looking for an amazing venue for your wedding photography, check out Blanc in Denver. Blanc is located in Denver, Colorado. Contact: (303) 974-7487, info@blancdenver.com. Location: 3150 Walnut Street, Denver Colorado 80205.